When China Spurns GMO Corn Imports, American Farmers Lose Billions : The Salt China has been a big and growing market for U.S. corn. But then farmers started planting a kind of genetically engineered corn that's not yet approved in China, and the Chinese government struck back. 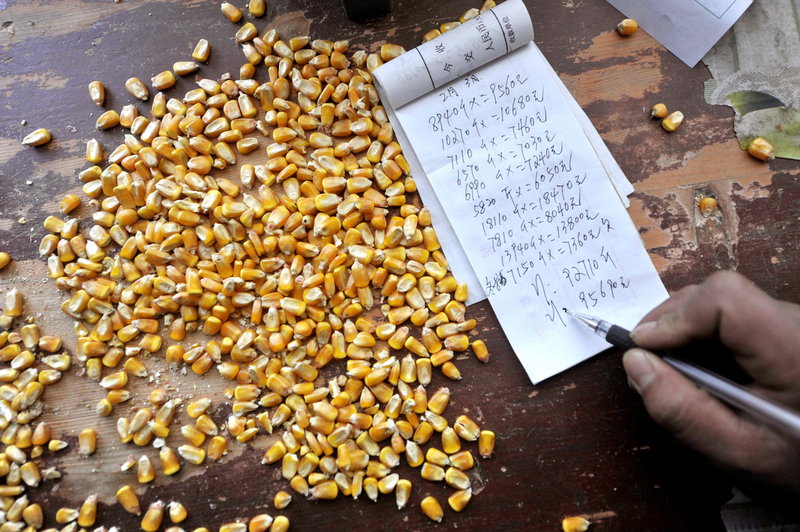 A corn purchaser writes on his account in northwest China in 2012. In November 2013, officials began rejecting imports of U.S. corn when they detected traces of a new gene not yet approved in China. For a while there, China was the American farmer's best friend. The world's most populous nation had so many pigs and chickens to feed, it became one of the top importers of U.S. corn and soybeans almost overnight. China also developed a big appetite for another corn-derived animal feed called "dried distillers grains with solubles," or DDGS, a byproduct of ethanol production. China's appetites for the stuff drove up global grain prices and filled Midwestern pockets with cash. This year, though, the lovely relationship has gone sour, all because of biotechnology. A couple of years ago, American farmers began planting a new type of genetically engineered corn invented by the seed company Syngenta. This GMO contains a new version of a gene that protects the corn plant from certain insects. Problem is, this new gene isn't yet approved in China, and Chinese officials didn't appreciate it when traces of the new, as-yet-unapproved GMOs started showing up in boatloads of American grain. The crackdown began in November 2013. China began rejecting shiploads of corn when officials detected traces of the new gene. By February of this year, U.S. exports of corn to China had practically ceased. At the time, some American grain exporters said that there was little to worry about. The Chinese move, they said, probably was intended to slow down imports temporarily in order to make sure that China's farmers got a decent price for their own corn harvest. As evidence, they pointed to the fact that China continued to accept imports of DDGS, which also contain traces of the unapproved gene. The U.S. sent $1.6 billion worth of DDGS to China last year. Well, last week, China expanded the ban to DDGS, shocking many traders. The price of DDGS plunged. According to the National Grain and Feed Association, the Chinese ban on corn and corn products may end up costing American farmers, ethanol producers and traders a total of about $3 billion. Max Fisher, director of Economics for the NGFA, who came up with that estimate, says the ban actually is hurting the Chinese, too. "They replaced [the U.S. corn] with more expensive grains," he says, such as barley from Australia. But one group of American farmers is benefiting: China is importing lots more sorghum. In an interesting twist, American farm groups seem unsure whom to blame. Some are angry at China. Others point their finger at Syngenta. A few days ago, the U.S. Grains Council wrote a letter to Secretary of Agriculture Tom Vilsack, urging his "immediate, direct, and personal intervention" with Chinese officials "to halt this current regulatory sabotage of the DDGS trade with China." "They're being a bad actor here," says Max Fisher of NGFA, referring to Syngenta. "They're making $40 million" selling the new corn varieties, "but it's costing U.S. farmers $1 billion." Syngenta, for its part, rejects any blame for the debacle. "We want to get technology into the hands of farmers as soon as possible," said the company's CEO, David Morgan, in a video released on Syngenta's website. "We can't expect growers to wait indefinitely for access to technologies, based on what foreign governments decide to do." According to Morgan, China has failed to make a timely decision on the new gene, which goes by the name MIR 162. Even if China approved MIR 162, however, the ban might remain. That's because Syngenta began selling yet another new new type of GMO corn this year, which also is not yet approved in China. Syngenta has asked farmers to take that corn to specific grain processors, who will keep it from getting into export shipments. But Fisher thinks the new gene is likely to show up in exports. "Farmers are going to be farmers," he says, and sell their grain through the usual channels.